We recently received a request from one of our customers who said it would be really good if you could view and edit attachments for a job. Our customer is an electrical contractor and they have a lot of certificates which are required for different types of jobs such as Electrical Installation Certificates (EICs) and Minor Electrical Installation Works Certificates (MEIWCs). Our customer wanted to be able to add a certificate in the office (often saved as a word document or pdf) which their engineer can view when they are looking at the job details. You could always view job attachments as part of the Okappy job management app and engineers could always add documents to jobs. However, what would be useful in this case, is for the office to be able to add a template certificate to the job which the engineer could then edit when they are out in the field. This would mean they wouldn't have to search through lots of different certificates on their devices. The office would also be happier as they know their engineer will be completing the correct certificate. We took the suggestion on board, and are happy to say that it is now available in v11.7 of the app. 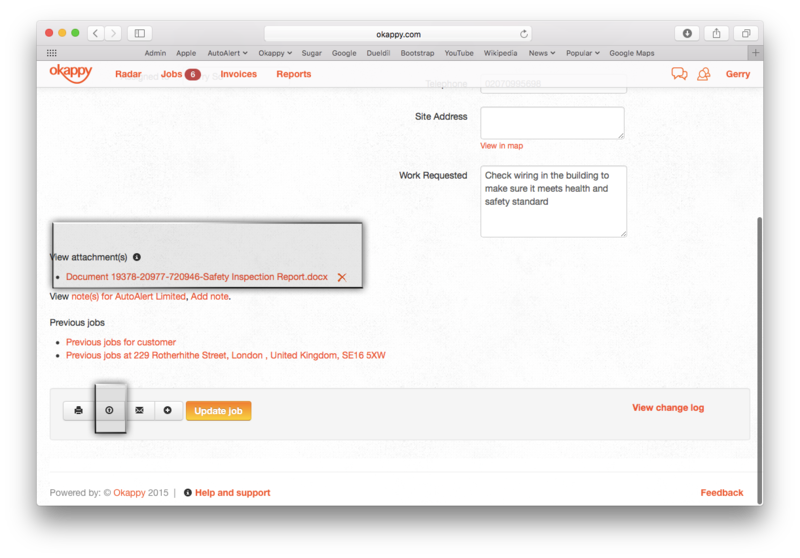 Following is our quick guide showing how you can add and edit attachments for a job. How to add and edit attachments for a job. Add your attachment to the job (i.e., a word document, excel spreadsheet, google document or pdf) by clicking the more option ( ) from within your jobs dashboard. Then click View/ Edit/ Update job. 2. Click on the add attachment icon ( ) then attach the relevant document e.g., a safety inspection report, an EIC, an MEIWC. Once it's attached, you can see it on the job screen. 3. From your phone or tablet, open the Okappy job management app. If you're already in it, then pull down in the job screen to refresh. When you go into a job you will be able to see the option to View attachments. 4. 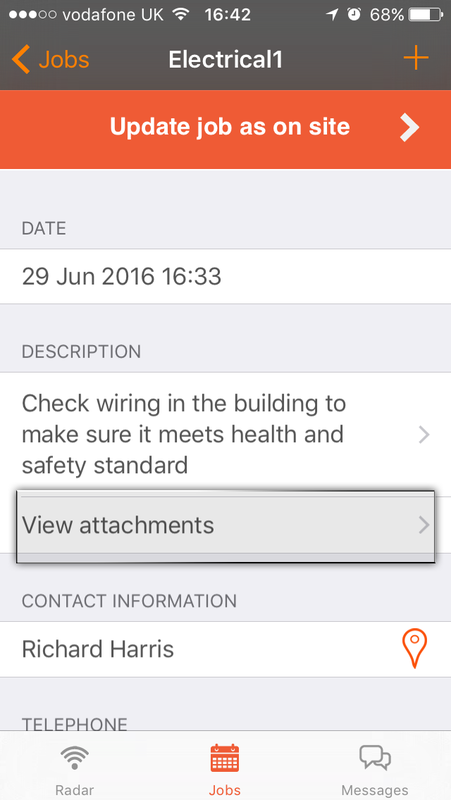 Click View attachments to see the list of attachments, then click on the relevant attachment, in this case the Safety Inspection Report. 5. You can view the attachment. You also have the option to edit the attachment in its own application, i.e., if the attachment is a Microsoft Word document, if you have Microsoft Word installed on your device, then you can open in Word. 6. 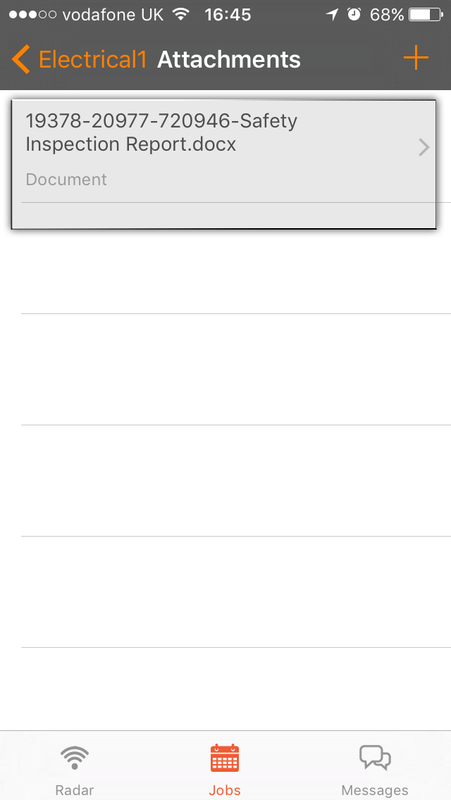 You can now edit the document, save it and then attach the latest version to the job. The admin staff in the office will be able to see the new document instantly when they look at the job details. Now all your information is stored in one place, no more spending time searching for different information or lost files in multiple different locations. Check out our Help & Support page to find more features designed to make your life easier.